Virat Kohli has been vaulting the standard for T20 batting this season. He was twitchy, though, after heavy rain delayed the start of Royal Challengers Bangalore's final league fixture at home against Kings XI Punjab by nearly two hours. The match was reduced to a 15-over shootout and Kohli had to bat with nine stitches on his left hand because of a split webbing, but nothing could stop him from scoring his fourth and fastest T20 century. He also topped the IPL run charts during his 50-ball 113 that powered Royal Challengers to an 82-run victory via D/L method. Royal Challengers' seventh win lifted them from fifth to second on the points table. 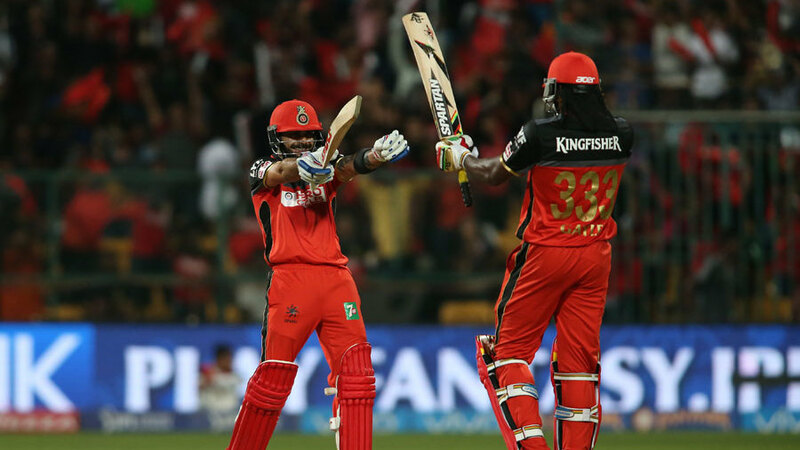 Chris Gayle was in his groove too, bashing 73 off 32 balls in a 147-run opening stand that floored Kings XI, who conceded 211 for 3 after opting to bowl. Kohli was the first to reach his half-century, off 28 balls, when he flicked Axar Patel to long-on. Four legitimate balls later, Gayle swiped the left-arm spinner over midwicket for six and raced to his own half-century off 29 balls. The two then got together and unfurled the champion jig.